Of course we decided that meant we had to paint the kitchen and bathroom and clean up the yard. On top of that, it’s summer. Since I’m a landscape contractor, I’ve been busy with other people’s yards as well! Add the bounty of fresh produce that has got to be put up, and blogging has just fallen off the radar. When the wedding and honeymoon are over, we’ll share some pictures and a report on how the food all came together for our big day! Enjoy your special day .. and I wish you both love, joy & good health! Congratulations! Hope you have a wonderful day and life together! Congratulations! i can’t even imagine how busy you must be. i really enjoy your posts and hope you are able to relax once the big day comes and enjoy the ceremony. thanks! Congratulations! That’s wonderful! I want to hear all about your day and how you managed to host your own wedding in your own home. I can’t imagine, it must be alot of work. Congratulations! I hope you have a wonderful day! Congratulations! I hope everything went beautifully yesterday! Congratulations! I was visiting to read your comments re fermenting and whey. 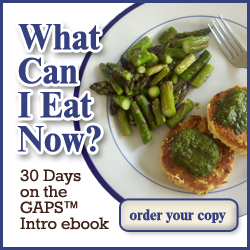 I’m 6 months on GAPS diet, and was helped so much by your blog getting started. I recommend it to anyone who is getting ready for the diet and looking for help, as yours is the best Intro I’ve seen. Very user-friendly blog. Best wishes to you both.